Cuisinart continues its commitment to superior quality and innovation with our state-of-the-art electric stainless steel knife. The Cuisinart Electric Knife delivers high performance with two stainless steel blades to tackle any task. The bread blade makes short work of crusty baguettes, and the carving blade produces clean restaurant-quality cuts. 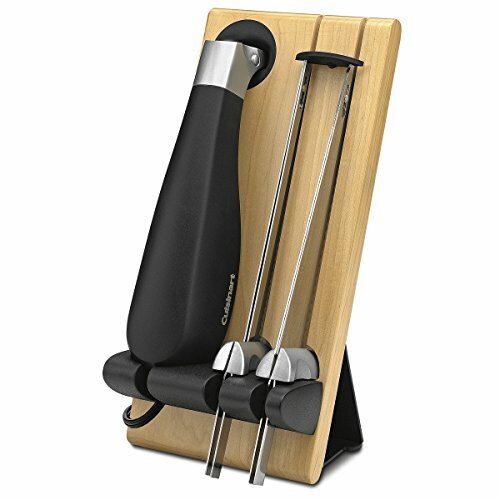 Ideal for slicing meats, loaves, and vegetables, the ergonomic handle accommodates both right- and left-handed people. The elegant solid wood butcher-block storage tray with safety lock system for storage looks stylish on any counter top or tucks away safely into a drawer.